Pro-Russian separatists insist that deal reached between Russia, West 'does not apply' to them. Armed pro-Russian separatists declared their intent to stay at their posts Friday, in defiance of an international deal which they claim does not apply to them. A landmark deal reached Thursday night between Russia, the US and the European Union (EU) called for the separatists, who have been seizing government buildings in eastern Ukraine for several days, to disarm and stand down - in exchange for amnesty. But the deal fell flat for the separatists, who insisted Friday that the deal was invalid. "[Russia] did not sign anything for us, he signed on behalf of the Russian Federation," Denis Pushilin, head of the self-declared Donetsk People's Republic, told journalists early Friday. Donetsk has been the heart of tensions between protesters and the Ukrainian government. Other protesters stated they have changed their views somewhat because of the deal, telling Reuters that "Vova" - a diminutive for Vladimir Putin - "doesn't love [them]" as much as they had hoped. So far, none of the separatists have left their protest sites, according to the Guardian, although meetings would be held later Friday to discuss the implications of the agreement. Several protesters have erected barricades around the seized government buildings, in an added show of defiance toward the ban. "We are not Moscow or Kiev," Vladimir Pakhomovich, a former miner, told the British news agency. 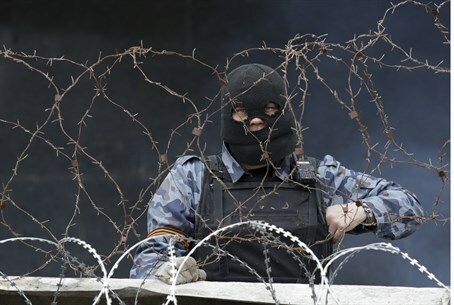 He stood near a barricaded building in Khartsyzsk, an industrial city 30 miles from Donetsk. "They do not command us. We are just here to defend our people." "Until we get a referendum, we do not intend to leave," he added. On Sunday, the Ukrainian government launched an "anti-terrorism" operation in eastern Ukraine, following violent pro-Russian protests and the seizure of government buildings. The move saw one Ukrainian official killed and five injured, as well as untold casualties on the protesters' side. The clash only heightened tensions in the region, with Moscow now calling the Ukrainian government "an illegitimate gang of fascists" and declaring intent to invade Ukraine militarily, according to Reuters. Several more government buildings have been seized in the wake of the killing. On Wednesday, Kiev confirmed that six armored vehicles in eastern Ukraine had been manned by protesters, and proved via photo evidence that they were tanks originally intended to retake control of the town of Kramatorsk during Sunday's operation. The escalation led, after several tense hours, to the diplomatic deal between Russia and the West - but analysts are unsure if the deal will hold.